ŠKODA permits the operation of mobile phones and two-way radio systems with a professionally installed external aerial and a maximum transmission power of up to 10 watts. Please consult a ŠKODA Partner for information about the possibility of installing and operating mobile phones and two-way radio systems with a transmission power of more than 10 W.
Operating mobile phones or two-way radio systems may interfere with the functionality of the electronic systems in your vehicle. The possible reasons for this are. transmission power greater than 10 watts. Concentrate fully at all times on your driving! As the driver, you are fully responsible for the operation of your vehicle. Only use the device in a way that you are in full control of your vehicle in every traffic situation – there is the risk of accidents! The national regulations for using a mobile phone in a vehicle must be observed. If a mobile phone or a two-way radio system is operated in a vehicle without an external aerial or an external aerial which has been installed incorrectly, this can increase the strength of the electromagnetic field inside the vehicle. Two-way radio systems, mobile phones or mounts must not be installed on airbag covers or within the immediate deployment range of the airbags. Never leave a mobile phone on a seat, on the dash panel or in another area, from which it can be thrown during a sudden braking manoeuvre, an accident or a collision - risk of injury. The Bluetooth® function must be switched off by a specialist workshop before the vehicle is transported by air. We recommend that mobile phones and two-way radio systems be installed in the a vehicle by a specialist workshop. Not all mobile phones that enable Bluetooth® communication are compatible with the universal telephone preinstallation GSM II. You can ask a ŠKODA Partner whether your telephone is compatible with the GSM II universal telephone fitting. The range of the Bluetooth® connection to the hands-free system is restricted to the vehicle interior. The range is dependent on local factors, e.g. obstacles between the devices and mutual interferences with other devices. If your mobile phone is in a jacket pocket, for example, this can lead to difficulties when establishing a connection with the hands-free-system or transferring data. The universal telephone preinstallation GSM II (hands-free system) includes a convenience mode for the mobile phone via voice control, the multifunction steering wheel, the adapter, radio or the navigation system. Phone Phonebook » page 94. Convenience operation of the telephone via the multifunction steering wheel » page 95. Managing telephone calls via the adapter » page 96. Telephone operation in the MAXI DOT display » page 97. Voice control of the telephone » page 98. Music playback from the telephone or other multimedia units » page 99. All communication between a mobile phone and your vehicle's hands-free system is established with the help of Bluetooth® technology. The adapter serves only for charging the telephone and for transmitting the signal to the vehicle's external aerial. The following guidelines must be observed » page 93, Mobile phones and twoway radio systems. A phone phonebook is part of the hands-free system. This phone phonebook can be used depending on the type of mobile phone. After the first connection of the telephone, the system begins to load the phone book from the phone and the SIM card into the memory of the control unit. Each time the telephone has established a new connection with the handsfree system, an update of the relevant phone book is performed. The updating can take a few minutes. During this time the phone book, which was stored after the last update was completed, is available. Newly stored telephone numbers are only shown after the updating has ended. The update is interrupted if a telephone event (e.g. incoming or outgoing call, voice control dialogue) occurs during the updating procedure. After the telephone event has ended, the updating starts anew. The internal phonebook provides 2 500 free memory locations. Each contact can contain up to 4 numbers. If the number of contacts loaded exceeds 2 500, the phone book is not complete. There are buttons in the steering wheel for easy operation of the basic functions of the phone » Fig. 98 so that the driver is distracted from the traffic as little as possible when using the phone. This applies only if your vehicle has been equipped with the universal telephone preinstallation (hands-free system) at the factory. If the side lights are switched on, the buttons and the symbols  and  on the multifunction steering wheel are illuminated. a) Valid for vehicles with the Amundsen+ navigation system. b) Valid for vehicles without the Amundsen+ navigation system. Only one telephone mount is factory-fitted. An adapter for the mobile phone can be purchased from ŠKODA Original Accessories. First push adapter A in the direction of the arrow » Fig. 99 into the mount as far as the stop. Then press the adapter slightly downwards, until it locks securely into position. Insert the mobile phone into the adapter A (as specified in the instructions from the manufacturer of the adapter). Press the side locks on the mount » Fig. 99 at the same time and remove the adapter with the mobile phone. Taking the mobile phone out of the adapter during the call can lead to interruption of the connection. When removing the mobile phone, the connection to the factory-fitted antenna is interrupted, which reduces the quality of the transmitting and receiving signal. The charging of the mobile phone battery is also interrupted. Function overview of the » Fig. 100 (PTT - “push to talk”) button on the adapter. Some adapters include the SOS button A » Fig. 100 in addition to the button. After pressing this button for 2 seconds, the number 112 (Emergency call) is dialled. To connect a mobile phone with the hands-free system, the two devices must be paired. Detailed information on this is provided in the operating instructions for your mobile phone. 1) Depending on the Bluetooth® version on the mobile phone, an automatically generated 6-digit PIN is either displayed or the PIN 1234 has to be entered manually. 2) Some mobile phones have a menu, in which the authorisation for establishing a Bluetooth® connection is completed by inputting a code. If the authorisation input is required, it must always be performed when re-establishing the Bluetooth connection. The following steps must be carried out for the connection. Activate Bluetooth® and the visibility of your mobile phone on your telephone. Select the Phone - New user menu in the MAXI DOT display and wait until the control unit has completed the search. Select your mobile phone from the menu of the units found. 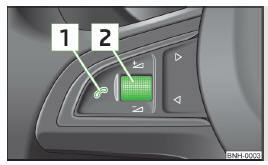 If the hands-free system announces (as standard SKODA_BT) on the display of the mobile phone, enter the PIN1 ) within 30 seconds and wait, until the connection is established2). To finish pairing, confirm the creation of the new user profile in the MAXI DOT display. If there is no free space available to create a new user profile, delete an existing user profile. During the connecting procedure, no other mobile phone may be connected with the hands-free system. Up to four mobile phones can be paired with the hands-free system, whereby only one mobile phone can communicate with the hands-free system. The visibility of the hands-free system is automatically switched off 3 minutes after the ignition is switched on and is also deactivated when the mobile phone has connected to the hands-free system. If you have not managed to connect your mobile phone with the hands-free system within 3 minutes of switching on the ignition, the visibility of the hands-free system can be reestablished for 3 minutes in the following ways. By turning the ignition off and on. By turning voice control off and on. In the Bluetooth - Visibility menu in the MAXI DOT display. 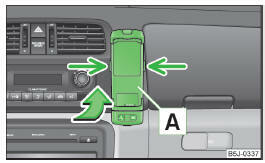 After switching on the ignition, the connection is automatically established for the already paired mobile phone1) . Check on your mobile phone if the automatic connection has been established. By withdrawing the ignition key. By disconnecting the hands-free system in the mobile phone. By disconnecting the user in the Bluetooth - Users menu item in the MAXI DOT display. Check the operating status of the mobile phone if the system reports No paired phone found. Is the mobile phone switched on? Is the PIN code entered? Is the visibility of the mobile phone active? Has the mobile phone already been paired with the hands-free system? If a suitable adapter is available for your mobile phone, only use your mobile phone in the adapter inserted in the telephone mount so that the radiation in the vehicle drops to a minimum. Placing the mobile phone in the adapter inserted in the telephone mount ensures optimum sending and receiving power. a) This function is only supported by some mobile phones. The following menu items can be selected from the Phone menu. The Phone book menu item lists the contacts downloaded from the telephone memory and the mobile phone SIM card. The following menu items can be selected in the Call lists menu item. In the Voice mailbox menu item, you can set the number of the voice mailbox2) and then dial the number. The following menu items can be selected from the Bluetooth menu item. The following menu items can be selected from the Settings menu item. Return in the Start menu of the telephone.